THE STORY - Elastigirl springs into action to save the day, while Mr. Incredible faces his greatest challenge yet -- taking care of the problems of his three children. THE GOOD - Expands the world, and allows Mr. Incredible and Elastigirl to grow as characters. Delivers pointed political commentary. And of course, the action is stunning. THE BAD - Overstuffed with characters and themes. Doesn’t do as much with Violet and Dash as it should. ​​​2004’s "The Incredibles" exploded onto the scene as a rebuilding of the wheel: a new direction for superhero and spy films that offered snappy action, playful homages, and plenty of heart. It landed in a world that had seen a Spiderman and Batman film or two but had yet to become hyper-saturated with superheroes. It felt fresh. "Incredibles 2" cannot say the same. 14 years later, the film instead is just one of many offerings from a genre that has offered us seemingly every possible angle. But just because Brad Bird’s sequel doesn’t rewrite the wheel doesn’t mean it doesn’t have plenty to offer. Like the best sequels, "Incredibles 2" keeps much of what made the original film work, while also expanding the world, and allowing its characters to grow and develop. 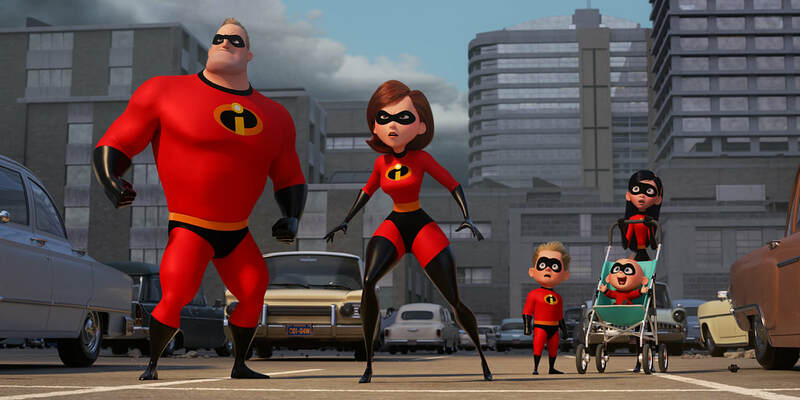 Picking up where 2004’s "The Incredibles" left off, "Incredibles 2" begins with the titular family navigating a city-wide attack from The Underminer (Voiced by Pixar regular John Ratzenberger). Although the family learned to work together in the previous film, their inability to truly collaborate when facing a massive threat like The Underminer shows they have a long way to go. Mr. Incredible wants to Hulk-smash his way to victory and steals the spotlight, leaving duties like caring for baby Jack-Jack to the others, who in turn resent attempts to sideline them. Their inability to collaborate allows Underminer to escape and leaves the city in ruins. With superheroes still technically illegal, and the government’s Superheros affair branch defunded, Bob, Helen, Violet, and Dash are faced with a choice: give up their Superhero lifestyle for good or accept the offer of flashy telecom mogul, Winston Deavor (Bob Odenkirk) to work on his behalf as paid superheroes for his company, and thus create a movement to relegalize heroes. When they choose the latter, Bob Parr (Mr. Incredible) finds his world turned upside down, when Winston and his sister, Evelyn, choose to make Helen Parr (Elastigirl) the face of their campaign (Because she knows how to save people without destroying millions of dollars of property). Specifically, Bob finds himself dealing with the usual parenting issues: a daughter who is dealing with the emotional trauma of being a high schooler, a son who struggles in the classroom, a baby who can escape his crib and poops himself and who can also fly, burst into flame, teleport, shoot lasers from his eyes, and transform into a demon. When a new Supervillain hits the scene, one bent on enslaving the public through hypnosis, Elastigirl must save the day, and overcome her anxieties about leaving her family alone, while Bob must learn to embrace his role as a nurturing dad while addressing his latent sexist insecurities. Most importantly, as a family, they must learn to work together. The Incredibles franchise works best when it is providing a twist on the 50’s "Revolutionary Road" style family drama. That was what provided the first film’s strongest moments. Although the new film features even more action beats than the original, Brad Bird smartly remembers where the heart is. As such, the film has the opportunity to explore gender dynamics to a greater depth than its predecessor. This time around, Bird inverts the typical 50s household roles, and as a result, acknowledges that Mr. Incredible is more than a little bit sexist. In many ways, Bob cannot handle not being the center of attention, and though he has always loved his wife, he secretly underestimated her potential. He thinks maintaining a household is easy, and believes in destruction, as opposed to her diplomacy. Meanwhile, Helen believes that her husband would be too incompetent to ever handle child-rearing and household tasks. And of course ultimately, Helen turns out to be a good hero, and Bob turns out the be a pretty solid dad. It’s the politics that really make this new take on The Incredibles stand out. This is the most ‘woke’ Pixar film to date, focusing on a huge array of issues, to the point that Brad Bird is practically slamming the viewer over the head with scathing lines attacking the political status quo: “Politicians just can’t believe someone would ever do the right thing if they aren’t paid for it.” “She’s rich…she’ll barely do any time in prison” Or after someone was clearly framed for a crime, the police growl “Sure kid…blame the system.” This time around, instead of debating whether Jack-Jack should use his powers in school, Bob and Helen are debating whether superheroes ought to follow laws if the laws are unjust. As a result, in many ways, the film is a much more mature installment in the franchise and provides far more role models for young women than the first one did, and even more than most other superhero films do. When Bird attempts to tackle this many themes, not all of them receive as much attention as others. We’re looking at political corruption, gender roles, police brutality, class warfare, toxic fandom, and more. One theme, in particular, is the villain: Screenslaver’s condemnation of our screen-based culture, which feels like a complete afterthought (Although the villain’s motivations are later revealed to more complex than they initially appear). Which brings us to the villain. You see who the villain’s secret identity is a mile away. And while Screenslaver receives a certain amount of depth (More than say your average Marvel villain), it is not nearly as memorable a villain as the first film’s Syndrome. And while the film mercifully avoids the trap many superhero sequels fall into of adding in too many villains, it still stuffs the film chock full of new characters (Including roughly a dozen new superheroes), many of whom don’t get particularly fleshed out. Even more frustratingly, with so much world expenditure going on, something has to give. As such, while Dash and Violet have plenty of time on screen, Bob and Helen receive the majority of the character development, while the two kids are saddled with more clichéd arcs (Violet spends most of the film moping over being rejected by the guy she likes, while Dash mainly…acts like a middle school boy). Samuel L. Jackson’s always entertaining Frozone is again largely just comic relief and a reinforcement in fight scenes. We have yet to meet his wife, or really learn anything about him outside of his superhero life, which is such a shame, because he is such a charming character. At the same time, the action sequences triggered by this overstuffing of characters are stunning. Bird proves once again that he is an extraordinary action director, transitioning adeptly from the micro (A claustrophobic apartment based fight scene evoking shades of "From Russia With Love") to the macro (A gigantic battle that incorporates a dozen superheroes on a cruise ship), and making both types equally compelling. And of course, the unrelated disasters wrought by Jack-Jack’s near unlimited supply of powers provide ample laughs. It’s not just Bird bringing his A-game though. Michael Giacchino returns with memorable James Bond-esque musical scoring and the film’s sound design is impeccable and inventive. The ending credits are delightful as usual and the Bond-inspired set design is creative while paying respectful homage to the genres Brad Bird loves. There’s so much to like in "Incredibles 2." But there’s also just so…much. While the film avoids just rehashing the beats of its predecessor, adding so many new factors means it is a very busy film and not every aspect gets the attention it deserves. It is tons of fun to watch, sure to entertain both adults and kids, and delivers pointed political commentary, made even more relevant in a post #MeToo era (Which is something that the first film did not do and which few superhero films have begun to do overall), but it also doesn’t feel like the breath of fresh air that the original was. Instead of being something new and unique, it is merely an above-average superhero film. And unlike the very best Pixar films, it doesn’t quite tweak your emotions. But so far, next to "Toy Story 2" and "Toy Story 3," this is Pixar’s most successful sequel yet. If it’s not truly ‘Incredible,’ it’s still pretty solid.